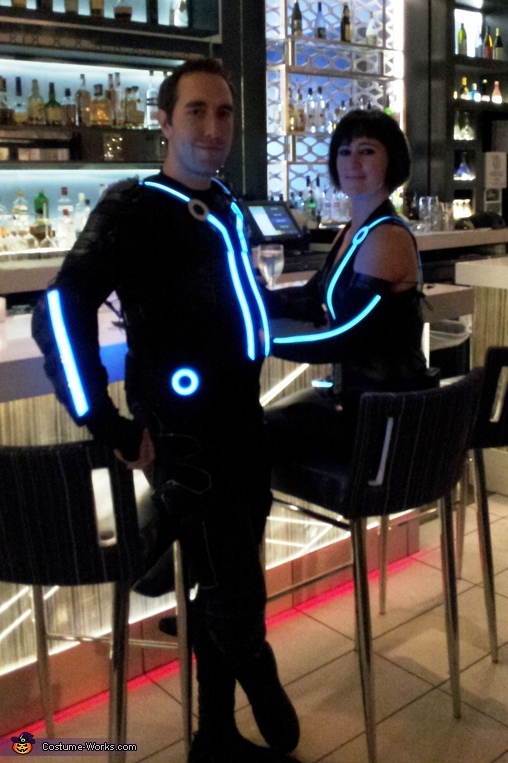 I made these TRON costumes for me and my girlfriend. I used electroluminescent tape running off packs of AA batteries. The identity discs are attached to the back of our costumes with a series of magnets I placed/glued inside each disc so they can be removed and re-attached easily. The Quorra suit ran off of a total of 10 AA batteries and mine ran off of 20 AA batteries which is plenty of power. Quorra: the arm covers are bicycle gunwarmers, the pants are from Sears (Kardashian collection), the boots are from DSW, the corset was ordered online, and the remaining fabric was purchased and cut to form the neck line and skirt. Sam: motocross FOX jacket outfitted with PVC drain caps to form the identity disc mount on the back. Shockskin hockey pants with padding for that futuristic/techno look. Aquasox for shoes, cut up some gloves, and underarmor underneath the jacket.